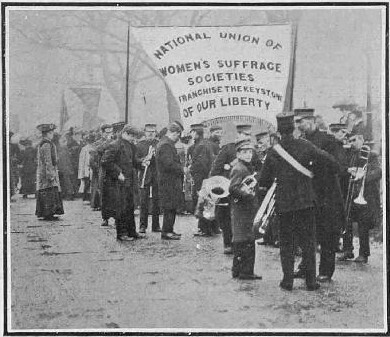 The United Procession of Women, or Mud March as it became known, was a peaceful demonstration in London on this date in 1907 organized by the National Union of Women’s Suffrage Societies (NUWSS), in which more than three thousand women marched from Hyde Park Corner to the Strand in support of votes for women. 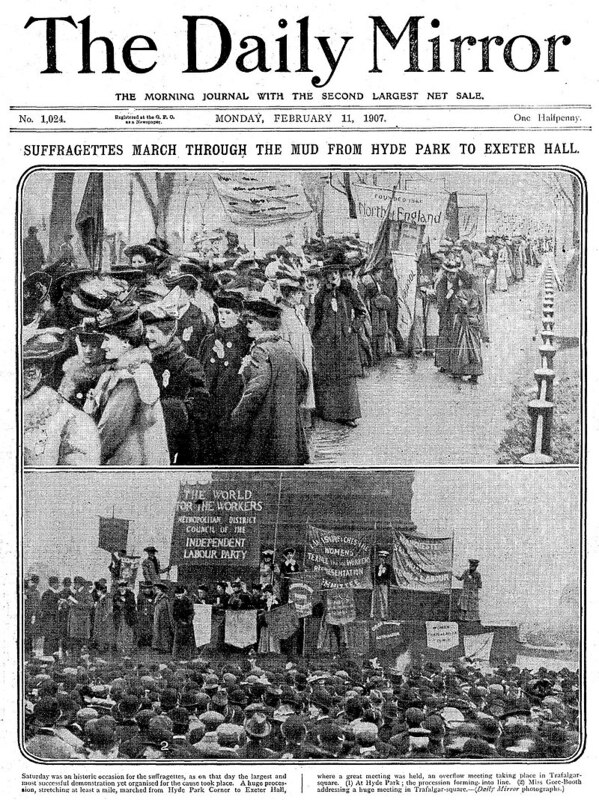 Women from all classes participated in what was the largest public demonstration supporting women’s suffrage seen up to that date. It acquired the name “Mud March” from the day’s weather, when incessant heavy rain left the marchers drenched and mud-spattered. The proponents of women’s suffrage were divided between those who favored constitutional methods and those who supported direct action. In 1903 Emmeline Pankhurst formed the Women’s Social and Political Union (WSPU). Known as the suffragettes, the WSPU held demonstrations, heckled politicians, and from 1905 saw several of its members imprisoned, gaining press attention and increased support from women. To maintain that momentum and create support for a new suffrage bill in the House of Commons, the NUWSS and other groups organized the Mud March to coincide with the opening of Parliament. The event attracted much public interest and broadly sympathetic press coverage, but when the bill was presented the following month, it was “talked out” without a vote. While the march failed to influence the immediate parliamentary process, it had a considerable impact on public awareness and on the movement’s future tactics. 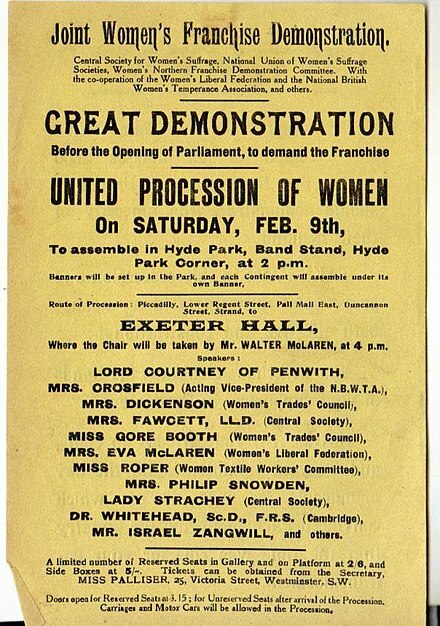 Large peaceful public demonstrations, never previously attempted, became standard features of the suffrage campaign. On 21 June 1908 up to half a million people attended Women’s Sunday, a WSPU rally in Hyde Park. The marches showed that the fight for women’s suffrage had the support of women in every stratum of society, who despite their social and political differences were able to unite and work together for a common cause. Lightly butter a 9-inch pie pan. To make the crust, combine the crumbs, melted butter, and sugar in a medium bowl until moistened. Press firmly and evenly into the pie pan. Bake until the crust is set, about 12 minutes. Cool completely. To make the filling, in a medium saucepan over medium heat, heat 2 ½ cups of the half-and-half, the sugar, and a pinch of salt, stirring often to dissolve the sugar, until simmering. Pour into a heatproof bowl. Rinse out the saucepan. Whisk the cornstarch and the remaining ½ cup of half-and-half until dissolved. Whisk the yolks in a medium bowl, and gradually whisk in the cornstarch mixture. Gradually whisk in the hot half-and-half mixture and return to the rinsed-out saucepan. Cook over medium heat, stirring constantly with a flat wooden spatula, until it comes to a boil. Reduce the heat to medium-low and let the mixture simmer gently, stirring constantly to avoid scortching, for 1 minute. Remove from the heat, add the chocolate, butter, and vanilla, and whisk until the chocolate melts completely. Strain through a wire sieve into a clean bowl. Pour the filling into the cooled crust and press plastic wrap directly on the filling to keep a skin from forming. Let cool completely. Refrigerate until the filling is chilled and set, at least 2 hours. To make the topping, whip the cream, confectioners’ sugar, and vanilla in a chilled medium bowl with an electric mixer set on high speed until stiff. Uncover the pie. Spread and swirl the topping over the filling. 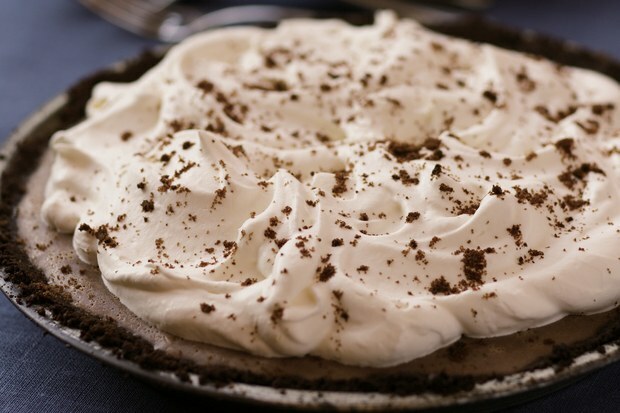 Sprinkle the pie with wafer crumbs. Chill.